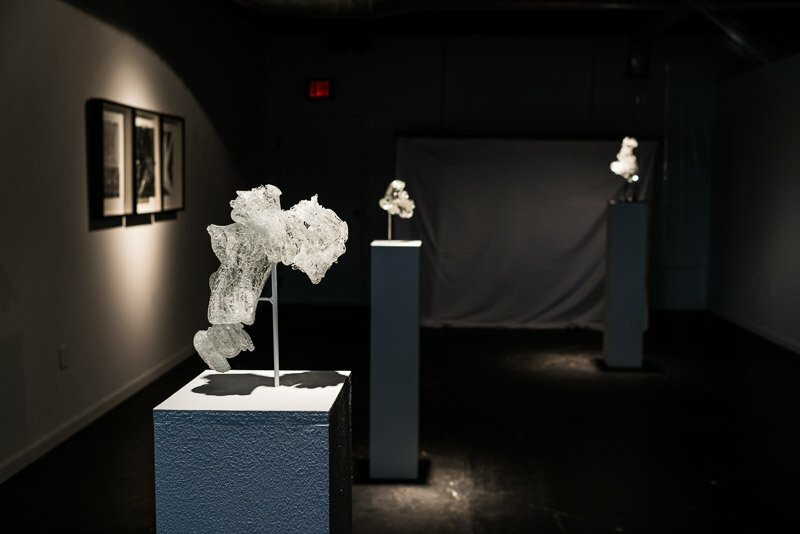 Guest blogger Danielle Marie Georgiou writes that UTA faculty member Justin Ginsberg experiments with glass in beautiful ways at Ro2 Art’s Downtown Projects space. The weekend is your last chance to check it out. Justin Ginsberg, Glass into Water: Plunge 1, 2013. Photo by Alisa Levy. Guest blogger Danielle Marie Georgiou is the artistic director and choreographer of DGDG: Danielle Georgiou Dance Group. She also serves as the Assistant Director of the UT Arlington’s Dance Ensemble. And she’s a member of Muscle Nation. Closing this weekend at Ro2 Art DOWNTOWN PROJECT, “Mesophase,” from upcoming local artist Justin Ginsberg, takes glass blowing to an extreme. Ginsberg uses non-traditional means to direct the molten glass toward a violent end – he’s concerned more with capturing the material in a precarious state of transition. The result: fragile pieces of spun glass perched on the verge of destruction. Additionally, Ginsberg has shown his work nationally, including a 2012 solo exhibition at the PEEL Gallery in Houston. He’s also had exhibitions at the Wichita Falls Museum of Art and the Corning Museum of Glass in New York, and he’s been included in New Glass Review, Architectural Digest, Modern Luxury and ArtLies. 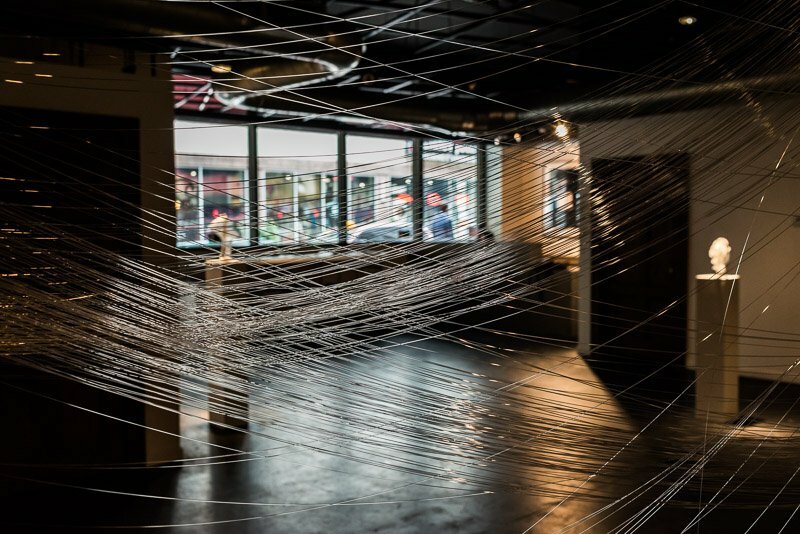 A view of the exhibition through the hand-pulled glass threads that comprise Justin Ginsberg’s Existence No. 5: One Single Life. Photo by Alisa Levy. His show at Ro2 continues the gallery’s commitment to showing work by new, up-and-coming artists, and its interest in glasswork. Last summer, Ro2 hosted a group of 30 glass artists (of which Ginsberg was one), in conjunction with the Chihuly exhibit at the Arboretum. “Immediately, we recognized an artist who stood apart from the crowd. Justin breaks from traditional methods used by contemporary glass artists and invents his own processes to create forms that are otherwise difficult to imagine existing,” says Jordan Roth, partner at Ro2 Art. “Mesophase” manifests what Roth saw in Ginsberg last year. 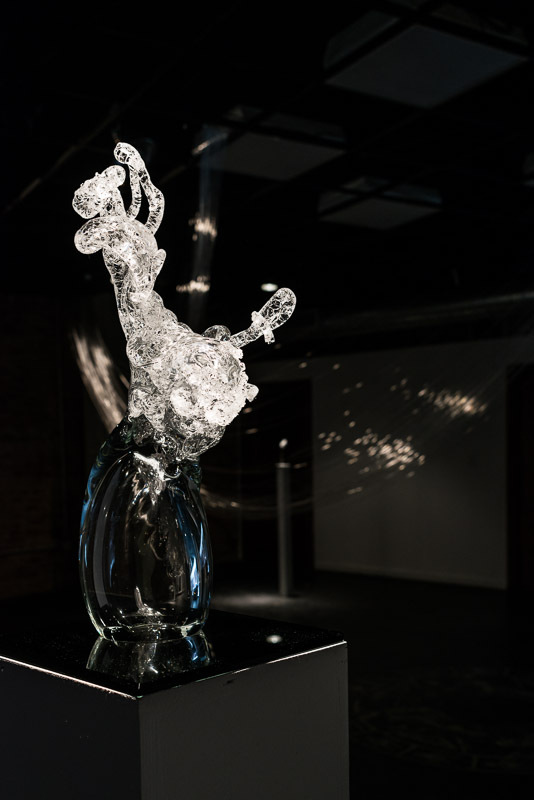 Whether pulling glass threads (with tweezers) from molten glass to create a floating installation, or dropping hot liquid glass into an aquarium to salvage beautiful remnants of this violent physical reaction, Ginsberg succeeds in producing sculptures that are visually stunning and technically unprecedented. A video, also entitled Mesophase, gives viewers a glimpse off the process the artist uses when he allows glass to interact with water. A closing reception will be held on Friday, June 7 from 7-9 p.m.
An Artist Talk with Justin Ginsberg will be held on Sunday, June 9 at 6 p.m.